“Establishing communications in the aftermath of a natural disaster is crucial, both for the coordination of aid and to enable those affected to reconnect with family and friends. Through our Instant Network programme, we are able to deploy our people and our technology to provide communications support at a critical time,” says Andrew Dunnett, Director of the Vodafone Foundation, Vodafone’s charitable arm. The Vodafone Foundation Instant Network Mini is a phone network in a backpack. Weighing 11kg, it can be taken as hand luggage on commercial planes and carried off-road into disaster zones to provide network access to people cut off from the rest of the world. It can be set up in 10 minutes and runs on power from its own fold-out solar panel – although it can also be plugged into a car cigarette lighter or a generator. The device connects via satellite to a host network enabling up to five calls at a time within a radius of 100 metres. The backpack also has inbuilt phone-charging capabilities. The Instant Network Mini supplements Vodafone’s earlier innovation, the larger and more powerful VIM, winner of the 2014 GSMA award for best use of mobile in emergency or humanitarian situations. VIM packs into four suitcases and at 100kg, it is much heavier than the backpack but has a 5km radius and four times the network capacity. The robust little backpack will be used in tandem with the VIM, targeting specifically those hard-to-reach areas that the larger kit cannot get to. 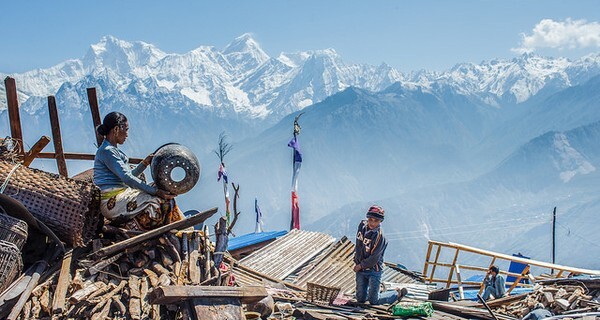 The backpacks were used for the first time in Kathmandu Valley following the devastating earthquake in Nepal, enabling text messages to be sent to thousands of people to provide crucial information in the crisis. Image ' Earthquake in Nepal' courtesy of Asian Development Bank.